Last year and the beginning of this year should remind us all to be humble when approaching the market. The experts were once again largely wrong in their predictions and have never been able to forecast the market with any consistency. Don’t try to either time the market yourself (you can’t!) or listen to those that say they can. A good advisor should not only keep you on plan and stay the course during market swings, but also keep tabs on your market anxiety and reduce your risk if it keeps you up at night. An honest advisor should also be aware of valuations and prepare you for potentially lower returns in the future. 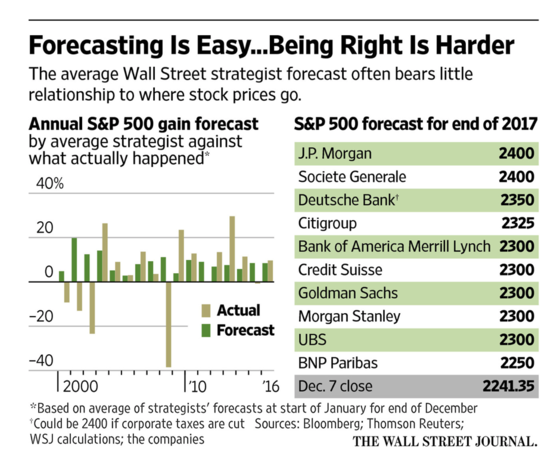 Forecasting the annual direction of the market is virtually impossible no matter who you are. 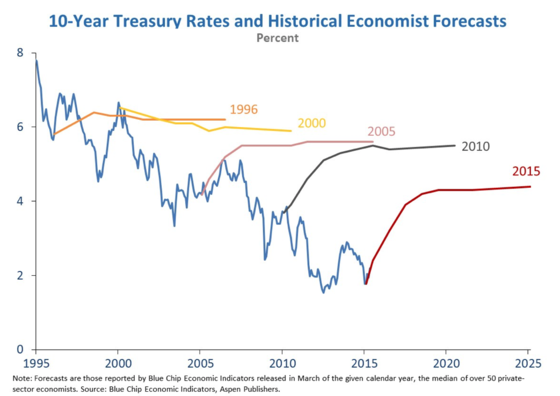 Nobel Prize winner Robert Shiller, lauded for having predicted the stock market collapse of 2001 and the housing bust of 2008, once again rang the bell warning of an overpriced stock market for the 4th time! 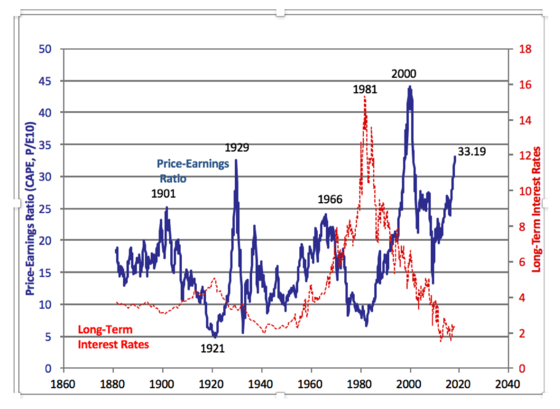 He first warning was in 2013 when his famous yardstick, the Cyclically Adjusted Price to Earnings (CAPE) ratio, was at 23, and again in2014, 2015, and early 2017 at valuations of 25, 27 and 29 . It’s now at 33. Wall Street banks are less apt to make bold predictions, but they too woefully under-predicted last year’s stock market’s performance with a median call of a 2.7% appreciation vs the actual near 20% appreciation. In fact, historically they simply extrapolate the last year’s levels forward as this range of prediction from end of 2016 highlights shows. The S&P 500 closed the year at close to 2,700. 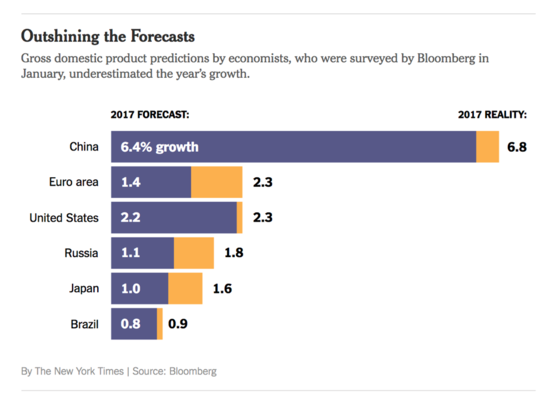 And Wall Street did no better predicting economic growth, failing to predict Europe and Japan’s recent rebound from their respective slumps. The point of this rant isn’t to make fun of “experts”. Instead, I hope to convince you that if “experts” can’t time the market (let alone pick stocks with any measured consistency), then you shouldn’t try either. 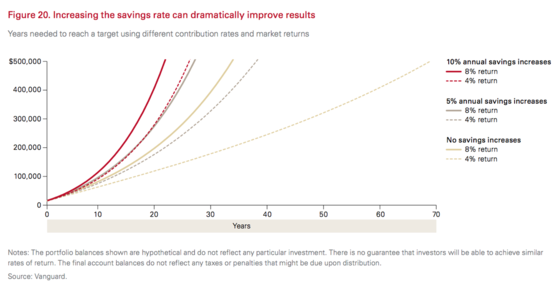 Vanguard and Morningstar, among others, have estimated that the costs to retail investors of trying to time the market are as high as 2.5% annually. Does this mean we should be blind to valuations? I’d argue no. In fact, I consider myself a value investor. For instance, without trying to predict interest rates, I detailed my view last year that investors weren’t being compensated enough (more or less not at all!) for taking the inflation risk imbedded in long-term bonds. They still aren’t. Likewise, we’ve historically invested in Closed-End Funds and more recently REITs backed by strong retail malls when they started to trade at significant discounts to their net assets. Given current equity valuations, we are more cautious, but we are also staying the course. As I stated in my last letter, the right reaction for investors is to prepare for lower returns going forward. 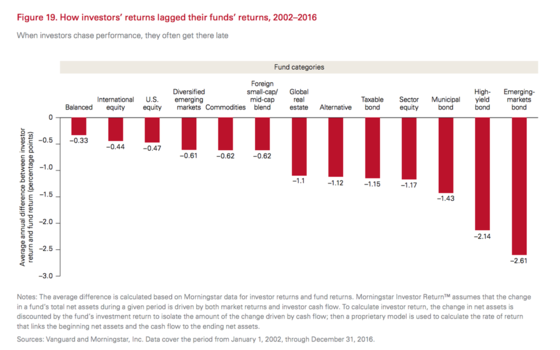 Of course, saving more augments your returns as Vanguard shows below..
One sure way to save is pay less in taxes and management fees, our focus along with personal diversification. But perhaps our most valuable contribution to your success is helping you develop a plan appropriate for your risk tolerance and sticking to it.